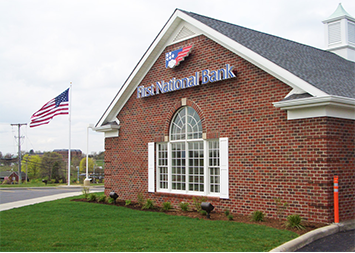 First National Bank in Monroeville, Pennsylvania offers an array of banking services and solutions designed to conveniently serve you. Our dependable team members are ready to assist you with all your banking needs. Visit this branch at 4220 William Penn Hwy or give us a call today at 412-373-7200 to learn more about our full range of commercial banking, consumer banking and wealth management solutions. Offering a 24-hour ATM for your banking convenience, this First National Bank branch in Monroeville, PA is located at 4220 William Penn Hwy. For after-hours banking, you can use our ATM to make deposits, withdraw cash or check your balance. Or, if you need help from one of our friendly team members, please stop in during normal business hours and we will be happy to assist you. First National Bank was founded in 1864, and offers a full range of commercial banking, consumer banking and wealth management solutions. If you are coming from near Plum, PA, head south on Old Leechburg Rd and turn left onto New Texas Rd. Turn right onto Center New Texas Rd and continue for 1.4 miles. Turn right onto Saltsburg Rd and then turn left onto Center Rd/Monroeville Trestle Rd. After 2.1 miles turn left onto Haymaker Rd/Old Haymaker Rd and continue for 0.8 miles. Arrive at First National Bank (4220 William Penn Hwy, Monroeville, PA 15146). If you are coming from near Level Green, PA, head north on Murrysville Rd toward Shady Dr and turn left onto Meadowbrook Rd. After 1 mile turn right onto Saunders Station Rd and continue for 1.7 miles. Make a slight right onto Haymaker Rd and continue for 0.5 miles. Use any lane to turn slightly right onto Mosside Blvd and continue for 0.9 miles. Arrive at First National Bank (4220 William Penn Hwy, Monroeville, PA 15146). If you are coming from near Murrysville, PA, head west on Old William Penn Hwy toward Sardis Rd and turn right onto US-22 W. After 2.9 miles continue onto US-22 BUS W (signs for US 22 Business/Monroeville/Interstate 76/Pennsylvania Turnpike/Ohio/Harrisburg) for 0.5 miles. Arrive at First National Bank (4220 William Penn Hwy, Monroeville, PA 15146). If you are coming from near Churchill, PA, head northwest on Beulah Rd toward Fenwick Dr for 0.5 miles and turn right onto Churchill Rd. Turn left to merge onto I-376 E/US-22 E toward Monroeville. After 4.5 miles take exit 84A for PA-48 S toward Monroeville. Merge onto Haymaker Rd/Old Haymaker Rd. Arrive at First National Bank (4220 William Penn Hwy, Monroeville, PA 15146).